I actually tried to get in and create in the craft room last night. I was so excited about squeezing in some time for creative purposes. I played around with some collage, but it just wasn't working for me. I looked around the room and realized that it was the space (or lack thereof) that was limiting my muse. I REALLY want to clean it up and do some work on eventually getting my etsy shop opened. But, I'm conflicted. My grandmother's surgery (mastectomy) is scheduled for Wednesday morning. I'm planning on staying with her and my mom on Tuesday night so I can be at the hospital with them first thing Wednesday morning. After that, who knows how long I'll be staying in Mobile to help out with things and be at the hospital. The problem is, I should really spend some time with LOML tonight before I spend so much time away. We have plans to see Steely Dan on Friday night, but between tonight and then- there's little time for him in my plans. I guess I should just see what he wants to do. If he just wants to browse the internet for hours on end searching for property, I can get into the craft room. If he doesn't, I'll entertain him in some way or another. In the meantime, I'm making lists of what craft items to pack for the hospital/mom's house. Hopefully, I'll be able to find everything on my list in the craft room without the overhaul it needs. Saturday: Tour of the Fantasy (Carnival Cruise Ship) in New Orleans then dinner and beers (AWESOME) at Hopjacks in downtown Mobile. Now, while I contemplate what to do, here's some "Made Me Smile Monday" for you!! Top 100 funniest one liners. I'm not sure about funniest, but there are def some on there that you'll want to remember. My favorite on the first page: "We never really grow up, we only learn how to act in public." He, he, he - then I NEVER have to grow up, right? Funny and clever tip jars. Unintentionally funny headlines. Some are NSFW, some are just tasteless, there are a few real gems in there though. Oh, the picture at the top? 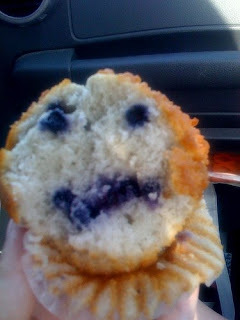 While riding to New Orleans I found this face in my muffin. How cool and creepy is that?